PRODUCT: #3 ROUND BASE RED SILICONE PIPE FLASHING. 7-3/4" DIAMETER BASE X 4" HIGH. CLOSED TOP. FITS 1/4" to 4-1/4" PIPE, ANTENNA ETC. PRICE/EACH. 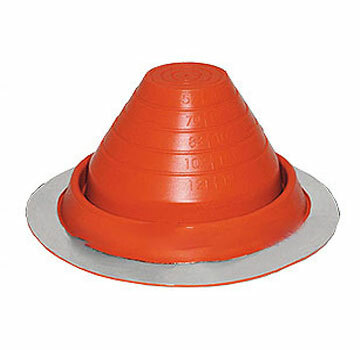 FEATURES: SILICONE MATERIALS, FOR PIPES, CHIMNEY PIPES, CHEMICAL PIPES, EXTREME ENVIRONMENTS AND SERVICE AREAS. SELECT and TRIM... Choose appropriate size opening about smaller than pipe diameter. As necessary trim opening to 20% smaller than pipe diameter. SEAL... Apply a bead of sealant between flashing base roof and at top edge to pipe.